At nearly 7 miles (11km) long, Ohope Beach is the ultimate North Island beach destination for water sports. The scenic stretch of soft white sand is just 10 minutes from Whakatane and is best known for its kayaking, surfing, and paddling. You'll find stretches of shoreline all to yourself on the beach's less developed eastern end, and beautiful views off the shore. Look toward the rolling and rugged hills of the Eastern Cape to see puffs of steam rising up from White Island—a famous, active volcano. 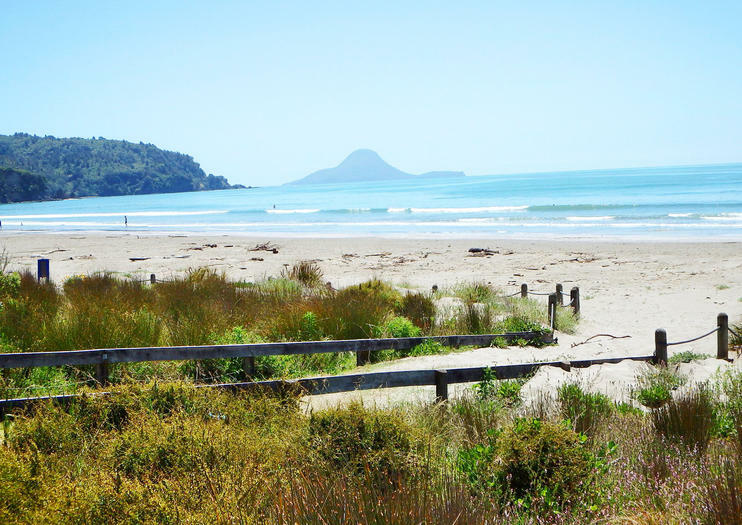 Thanks to the area’s abundant sunshine, Ohope Beach has repeatedly been voted as New Zealand’s most popular beach, and just next door, at Ohiwa Harbor, migratory seabirds gather en masse to the delight of North Island bird watchers. Up on the hill that separates Ohope from neighboring Whakatane, the remains of Maori pa, or forts, serve as reminders of the ancient history that lines this section of coast, where Maori explorers first made landfall, and the culture continues to thrive today at this gate to the Eastern Cape. Insider's Tip: For a scenic walk at Ohope Beach, follow the Kohi Point Scenic Track at the far western end of the beach. The best swimming is at Mahy Reserve, where there is a roped off swimming area and lifesaving club toward the western end of the beach. There are plenty of restaurants and accommodations toward the western end of the beach, whereas the eastern end is more residential with only a handful of shops. The beach is most popular from December to February when the water can warm up to 72°F (22°C), though the water temperature in August only drops to about 58°F (14°C).